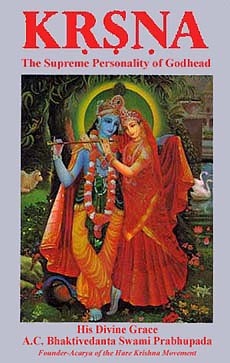 "I request that you take advantage of this book KRSNA, and enter into its understanding. I also request that you make an appointment to meet your God now, through the self liberating process of YOGA (UNION) and GIVE PEACE A CHANCE." Krsna, The Supreme Personality of Godhead tells the story of Krishna's life from Srimad-Bhagavatam,the summit of the ancient Vedas from India. This book is presented as a collection of beautiful readable short-stories and illustrations. It forms a biography of the life of Krishna, who was present in India five thousand years ago. The stories develop from Krishna's birth to His childhood and youth. Krishna plays with His boyfriends in the forest while looking after the cows and calves and incidentally He kills so many demons. On some full-moon nights He dances with Radha and His beautiful girl friends, the gopis in the rasa lila.